This is not going according to plan. By now I was hoping to have edited all the images. I have not quite got that far, so this is post number 1 about editing my photos of Santorini. Having imported the images into Lightroom, and selected the images I want to work on, I put the images into stacks as part of the image selection process (so there is only one image on view and not all three). Now I need access to all the images again. The first job is to create the HDR Merge files. This is very much a mechanical process, and one that I wish I could automate in Lightroom. Thinking about it I am sure there is something called actions in Photoshop that I could use. Regular readers will know how much I love Photoshop, and that this is not going to happen. How do I create the HDR files in Lightroom? This is how I create HDR files from a photography shoot. It does not matter if it is 10 images or 100 images – the process is exactly the same and is just a case of getting through the process as quickly as possible. Having put all the images into stacks, I have to collapse all the stacks to get the picks that I want to edit. The picks that I am going to edit are in a folder called picks by now, so all I need to do is this. Right Click, select Stacking, then Expand all stacks. And there are all the sets of bracketed images. Three per bracketed image capture. Next, I press Control D, so no images are selected, and slide the zoom slider so the number of images in view is right for what I am about to do. This will vary depending on the size of your monitor – I now have a BenQ 32” monitor (which is fantastic by the way). Something like 6 images on a row is plenty – this gives me 3 rows as well – plenty to go at. Next, I right click on the second and third images in a bracketed set, then select Control H. This brings up the HDR Merge Preview box. I select the following options. Deghost amount – I normally leave this on None. Deghost during an HDR Merge process fixes a problem with movement between frames – check out this helpful page on the Adobe website all about HDR Photo Merge. Then I hit Merge, and Lightroom makes a start with the first HDR Merge. And that is the first HDR Merge started. Why only two images I hear you say? Why do you not use all three? I will talk about this more in the image capture post, but for now all you need to know is that to create the HDR Merged file in Lightroom you only need the last two images, not the first. Try it and see. The HDR file is identical with 2 or 3 images. Once Lightroom has done its thing, I check that the first edit is ok. If all is fine with the settings and I am happy that these will be ok for the rest of the images I am working on then this is what I do next. And this is the good bit. This starts up an HDR Merge in the background. Then I go to the next set of three images and do the same. And then just keep on going. I get to somewhere between 20 and 30 before my computer starts to groan. At this point I go and do something else, like make a coffee, or if I am working in the evening grab a beer. And I leave Lightroom to it. I pop back after a bit, and if a good number of these HDR files have been created I add some more, topping up the workload I give Lightroom/ my PC. I know that when I am going to be doing this I am going to leave my computer for periods of time, so I plan this accordingly. It does not take long to get 30 HDR merges going, just a couple of minutes, so this can be built into normal life. Once this is all done I remove any flags or ratings from every image, and add the HDR file to the stacks. What is the new file that Lightroom has produced? When I say HDR file what Lightroom is actually creating is a new .dng file, which is in effect a new RAW file. This is quite amazing on its own. The dng file is a new RAW file, and the starting point for my editing. First though I have to add these new files to the stacks – Lightroom does not do that for you, although it would of course be nice if it did. I have fond the quickest way to do this is one by one. If you try the auto-stack by time you have to move them to the top of the stacks and it is just more cumbersome. I select the three original images along with the new dng RAW file. Once the four images are highlighted I have to click on the dng file so that is highlighted lighter than the other three images, and then I can use the keyboard shortcut Control G to make them a single bracketed set of images. If I click on the image before creating the new stack the dng file is put to the top of the stack, which is where I want it. If I did not do that, or if it did not work, I add the new file to the top of the stack by clicking on the number 4 on the thumbnail. And I do this to all the bracketed sets. Don’t worry – it does not take too long. When done, and assuming that all the HDR merges went fine and there are all these sets of 4 images in bracketed sets, all I need to do is collapse every stack and I have the new HDR files in view. Last thing in this section is to add these dng files to Lightroom Mobile – this is the first time I do this usually, as these are the images I want to look at. What I have described in this post is pretty much the first stage of my image editing, which I do to every image. Next is the editing, image by image. I will come on to that next week – this is as far as I have got to date. That gives me a week to get the edits done. Title – I just use the filename for this. Keywords – 20 – 30 keywords that also describe the image. 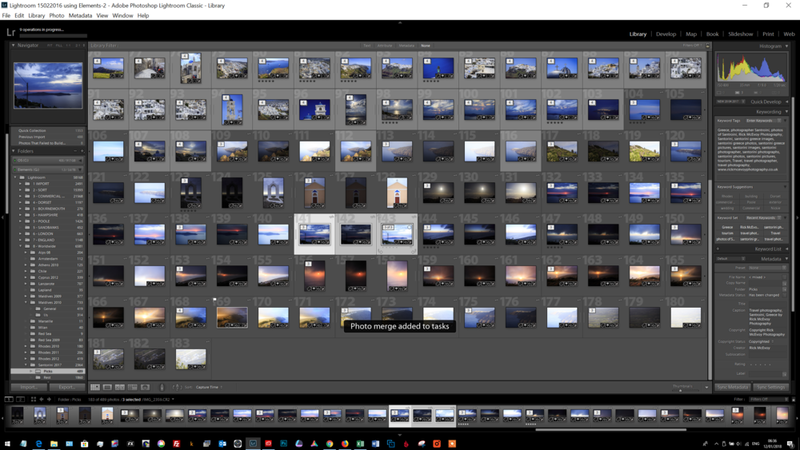 Now time to get some editing done of these pictures of Santorini, which I will write about next Friday, when I have a set of fully edited images.